I don’t often have chips at home, but since it was just my Dad and me in for dinner on Saturday night I treated him to steak and chips and I much prefer the home made kind. This is mainly because I don’t like buying anything pre-prepared, especially when it’s really easy to make, but also because they’re much nicer than anything out of a freezer bag. Chips don’t always have to be the worst thing in the world, at the end of the day they’re just potatoes. I’m not saying this recipe is super-duper healthy and good for you, just baking the fries in the oven rather than frying them in a vat of oil means they’re not soaking up as much fat and the end result is less greasy. I’m going to leave quantities out of this because it’ll depend how much you’re making. 2. Slice potatoes, leaving the skin on, into fries. 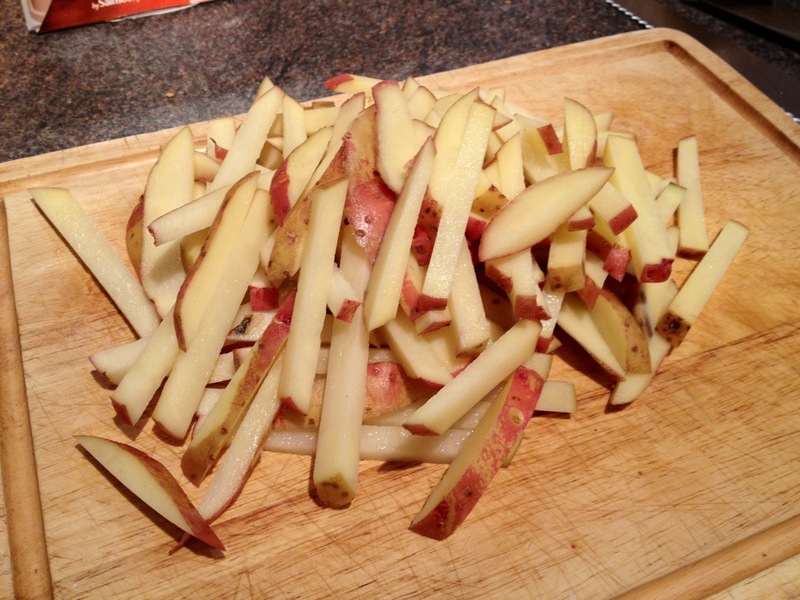 I’ve done skinny fries, cut them thicker if you prefer a chunkier chip but they will need just a tad longer in the oven. I prefer not to peel the potatoes as the skins go nice and crispy in the oven. 3. 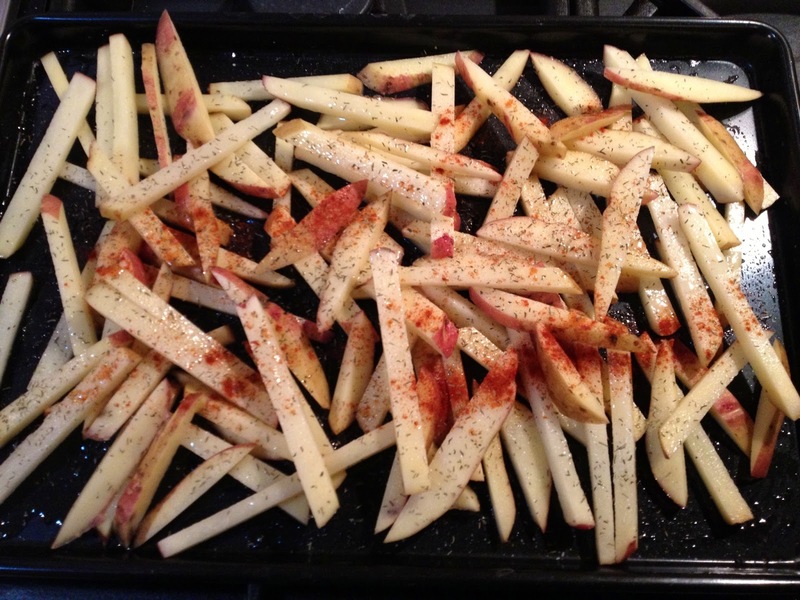 Brush a baking tray with oil, so the fries don’t stick, and spread them over evenly. 4. Season generously with salt and pepper and sprinkle over the dried thyme and the smoked paprika until coated. Toss the fries around so they’re covered evenly. 5. Place into the oven for 15 minutes. Take out, and toss the fries around to ensure they’re not sticking. Return to the oven for a further 10-15 mins or until golden and crispy. 6. Meanwhile crush the garlic with a little salt. 7. When the fries are ready, sprinkle the garlic over and toss to cover. 8. 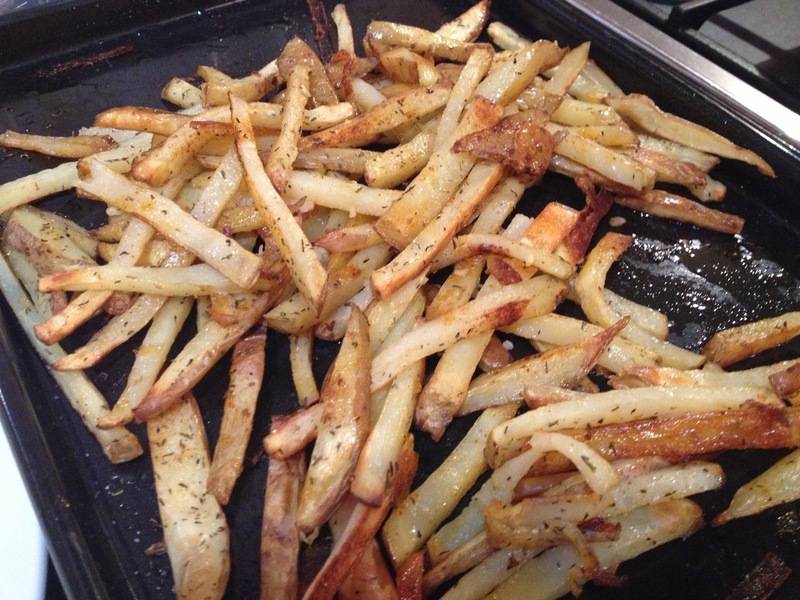 Remove the fries from the tray and spread on kitchen roll to soak up any excess oil before serving up. Serve these up with steak or homemade burgers, or just serve with dips for a naughty snack. You can also play around with the herbs and spices you sprinkle over to vary the flavours. You could leave out the paprika if you just want a herby rather than a smokey flavour or if you fancy something hot add a little chilli powder. Get Diary of a Saucepot Email Updates!